Resources for Portable Planetariums - International Planetarium Society, Inc. Mobile domes are an important part of planetarium outreach and serve countless people who otherwise would never experience astronomy and the stars under the magic of the dome. Resources here have been gathered by the Portable Planetarium Committee. Susan Reynolds Button, committee chair, also is the long-time writer of Mobile News, which appears in each edition of Planetarian. The Lhoumeau Sky-System is a concept of a planetarium projector that can be made at low cost for small and medium planetariums. All instructions are shared under a Creative Commons license. 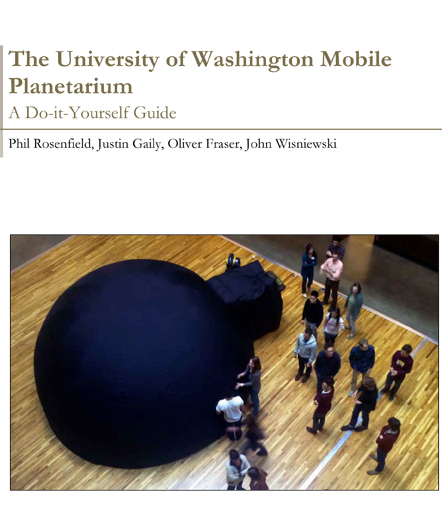 The University of Washington's Astronomy Department (Seattle, Washington), based on experience in establishing its own mobile planetarium outreach, has published a Do-It-Yourself guide to making making your own. Download by clicking the picture of the cover, or follow this link to arXiv at Cornell University. A dome-building guide from Adam Goss in Broomfield, Colorado. Click on the picture of the cover to download the pdf document. A site designed by a science teacher on the elementary and junior high level, this newly-redesigned site by John Krieger has been updated and re-titled Astronomy For Thinkers. Although aimed primarily for science educations and home school teachers, the site also is open to anyone interested in astronomy and sharing the beauty of the sky. In the articles section you'll find a number of downloadable materials, and also A Digital Home Planetarium: How to make a home planetarium using cardboard, a mirror, and a digital projector. What Projector Should I Purchase? Kindergarten students in Japan wait to visit a portable dome; photo provided by Hiroshi Futami. Chuck Bueter of Indiana sets up a portable dome in a greenhouse.